Make sure you get your rewards! The Boss Monster shop is open for business! Our final official post: Thanks to you all! Obviously a typo in that survey sent last night. 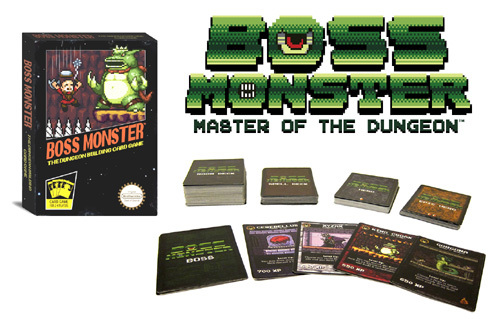 Boss Monster will ship in early Spring 2013 (not 2012). Our apologies for any confusion. The Kickstarter campaign may be over, but we're still hearing from lots of people who want to find some way to pre-order the game. Well, we have some good news: the official Boss Monster store is now open for business! You can pre-order the final retail version of the game for $25 (the suggested retail price when the game hits stores next spring) and the slate gray Boss Monster T-shirt for $20. Shipping is extra, and currently we're only shipping within the United States, Canada and Mexico. Now we think these are pretty great prices, but obviously not as good a deal as people got during our Kickstarter campaign. So to sweeten the deal a bit for anyone arriving late to the party, we have a special coupon code for $5 off one order between now and the end of the year: JustMissedIt. So if you're just arriving to Boss Monster now, enter the JustMissedIt coupon code during checkout for $5 off. Or if you're a current backer who wants to share the fun of Boss Monster, feel free to spread the word about the JustMissedIt coupon code. Please note that shop.bwisegames.com currently only accepts payments via PayPal, but we will take Visa and Mastercard by early next week. We will also add in additional international shipping options at that time. Finally, if you're just getting into Boss Monster now, check www.bwisegames.com for future updates, and be sure to Like us on Facebook. Or participate in the community by joining the forums at BoardGameGeek. There's a lot of exciting Boss Monster news to come, so we're excited to have you join us! One month ago, two brothers pressed the launch button on a $12,000 campaign to try and raise the minimum amount of cash needed to take Boss Monster to print. That moment was both nerve-wracking and exciting. We were releasing our baby to the masses, and just hoping that folks would see the same fun, nostalgia, and cleverness in it that we did. 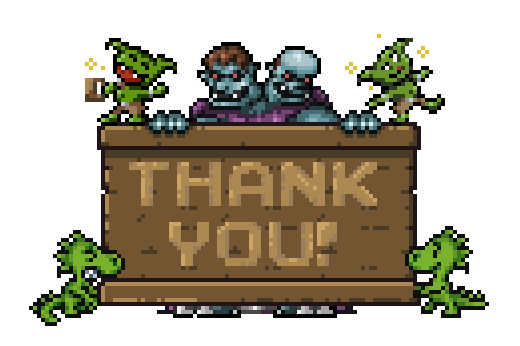 One month later, we find ourselves humbled (cliché, but true) by your generosity, your spirit of community, and your excitement for a game that we’ve poured our hearts into over years of development. You have made our dreams come true in ways that we can’t even begin to describe. Thank you. We’ve received multiple e-mails over the past month asking how we did it. We have some guesses, and a lot of “hell if we knows,” but one thing we know for sure is that we couldn’t have done it alone. There are too many people to thank properly, but we wanted to mention a few here. Joe LeFavi of Quixotic Transmedia, who provided Kickstarter consultation that any committed game designer wannabes would be wise to avail themselves of. William Alvarez and Victor Quadros, who filmed and edited our welcome video. Our artists -- especially Katrina Guillermo, Francisco Coda, Kyle Merritt, David Nyari and Kahlief Steele -- who created that retro-gaming look that you’ve come to know and love. Our playtesters, most notably David Chang, Dave Baker, Will Oberkrom, and Keith Baker. Nate Mitchell of Squid Kids Ink, for his marvelous 10-Dohs. And of course, our beautiful wives, Beverly and Victoria, who supported us during a grueling month of working two full time jobs. What comes next? Now you all get to take some time off from promoting this game and we get to work on sending it to press. This week, you’ll receive a survey from us via Kickstarter asking for your contact info and asking you to confirm your add ons. In two weeks, after Amazon finishes processing payments, we’ll be sending out the various digital goodies to the appropriate pledge levels (including the MP3, the strategy guide, and the create-your-own-cards pack). We’ll also be preparing game prototypes to be mailed out in early December to our Super-Speed pledgers. Between now and the new year we’ll be bringing www.bwisegames.com up to speed with our playtesting forums and our online store. If your friends missed out on this Kickstarter, tell them not to worry; soon they’ll be able to pre-order the game through our online store. (That's without all the Kickstarter exclusives, of course. Those are just for you guys). During all of this we’ll be putting final touches on the card text and instruction manual, primping our card art and box art, and preparing all our files to go to the printers. There's a lot to accomplish between now and our target ship date of late February, but we have everything lined up to make sure that you receive the premium-quality game you deserve. Thank you again from the bottom of our hearts for your generosity and passion. It's funny to look back on our early days of long debates over whether our goal would be $12,000 or $13,000, or wondering how the heck we'd ever get 20 people a day to pledge for our game. We've come a long way since then, and we have no intention of slowing down. Brotherwise Games is here to stay, and this is just the beginning for Boss Monster and beyond. Who's the Boss? That was a corny tagline at the beginning of this campaign. Now, $190,000 later, it's just asking the obvious. You guys have more than owned the game of Boss Monster, you've defined it. In 30 days we've become one of the top 10 grossing game launches on Kickstarter, we've seen a community of excited players develop and push the game in exciting new directions before it's even on store shelves. And for Chris and Johnny, we've had the ride of our lives. So $190K happened a bit faster than even we were expecting, and you've forced today's post to come out a little earlier than we planned. If you're in the Power-up Pack level and above you've earned yourself a nice set of Kickstarter exclusive, never-to-be-printed-again, holofoil versions of the nine original boss cards in addition to the normal ones that come with the game. If you've already selected the option that's right for you, don't forget that it's not too late to add a Boss Monster T-shirt! To add one on, select Manage Your Pledge, add $20 to your order ($30 if you live outside the U.S.) and be sure to send us a message letting us know your preffered size: S, M, L, XL, 2XL or 3XL. What? What's that? Did we forget something? Oh yes! You're probably looking for another stretch goal. Alright, since everyone was telling us $190K was completely unreasonable, and you destroyed it with more than 24 hours to spare, how about this, reach $210,000 before close tomorrow, and we'll do all the bosses in the game as holofoils for everyone in the Power-up Pack and above. Yep, that's not just the nine basic bosses, but the four custom-creator bosses and the two creator pack bosses as well. Can it be done? Maybe. Maybe. But it will take a final 24 hours that redefines what it means to be a successful Kickstarter project, and redefines what it means to be a Kickstarter backer. It will only happen with an extraordinary amount of legwork on everyone's part, but that's something we've seen from you guys time and time again. Let's see what a few Boss Monsters can do.